, which engage students and provide real-world reading practice.  Exclusive! Issues to Debate presents two sides of an issue and involves students in discussion as it sharpens their problem-solving and critical-thinking skills.  Be An Active Citizen is embedded in every lesson and models active involvement in government.  Landmark Supreme Court Cases chronicle significant cases and show why they are important. Skills and Assessment  Skill Builder lessons teach and apply skills used on assessments and in life; practice opportunities ensure student mastery.  Standardized Test Practice allows students to become familiar with a variety of test formats and questions. 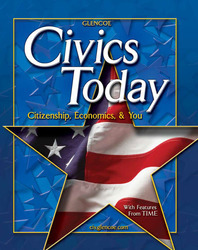 Be an Active Citizen Why Study Civics?